UTTARADIT, Jan 21 – The provincial administration and private sector here are expected to show up in full force as Prime Minister Yingluck Shinawatra leads her ministers and high-ranking officials to a mobile cabinet meeting in this primarily agricultural province today. Uttaradit Governor Chalermchai Fuangkon said provincial officials are ready for the meeting which will take place on the campus of Uttaradit Rajabhat University. Six major issues slated for discussion today involve trade and investment promotion including the opening of the Mae Sot special economic zone in Tak province, reviewing a project to develop Phitsanulok as the transport hub for Thailand’s lower Northeast and the Indochina region, and water resource management. The Uttaradit administration will propose many projects for cabinet deliberation, such as opening a permanent checkpoint at Chong Pudu Pass, tourism promotion for the farming district of Laplae and a budget request for Bt1.2 billion to develop Uttaradit Hospital as a major medical centre. Two other national sessions to be simultaneously held during the cabinet meeting are that of the Joint Public and Private Sector Committee and a meeting of governors from the lower northern provinces. Deputy Prime Minister/Education Minister Phongthep Thepkanjana arrived yesterday and was briefed on a planned communication network and a large flood prevention project in the province under the government’s Bt100 million development budget. Both will be considered by the cabinet today. Mr Phongthep said Uttaradit, 490km north of Bangkok, is a feasible base for a communication networking project linking Thailand with Myanmar in the West and with Laos in the East. In the Joint Public and Private Sector Committee, Thai investors and industrialists will discuss development of high-speed and dual-track rail systems to upgrade Thailand as the a transport hub, or what they called the “Indochina intersection”, in preparation for the ASEAN Economic Community (AEC) in 2015 and to promote domestic tourism. 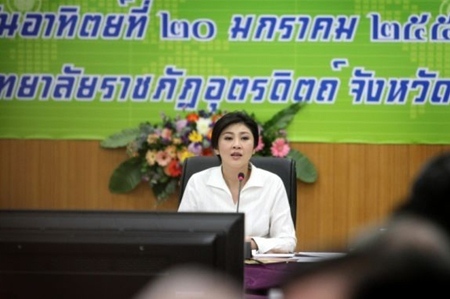 In nearby Tak province, Ms Yingluck and some cabinet members were briefed on the planned development of a special economic zone in the Thai-Myanmar border district of Mae Sot. Tak Governor Suriya Prasartbundit said the northern province generates an annual revenue of Bt40 billion – Bt39 billion from border trading, and revenue will possibly increase to over Bt50 billion when Thailand is integrated in the AEC.